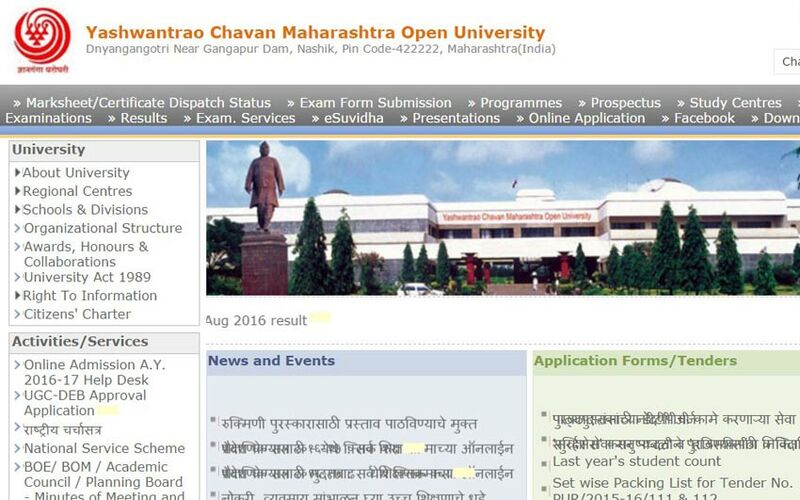 YCMOU Online admission, Maharashtra, Sep 4: The Yashwantrao Chavan Maharashtra Open University (YCMOU) is located in Nashik, Maharashtra(India). The University has been extended the admission period by the concerned department of the university. The YCMOU online admission began on 21st July 2016 for the distance learning courses. According to the new update, the extended admission date is applicable for all the courses except Agricultural Science and B.ed. Arjun Ghatule, the Controller of examinations (YCMOU): Urged students to avail the opportunity of the extended date for admission. The University made it easy for all the students in the state of Maharastra to apply application through online. The university opened the online admission for various courses in the middle of July 2016. Maximum of students already applied through online from their Personal Computer and also from cyber café. The university has its own divisional centers across the state. So, the students can contact directly in that centers for admission. If you have any queries about the admission in YCMOU, then you can call to following phone numbers. Or also, visit the official University website.